Churg-Strauss Syndrome (CSS) is rare in children. Reported cases had respiratory symptoms with preceding asthma or allergic rhinitis. We report a 10-year-old girl with multiple vasculitic skin lesions and foot drop without the usual history of asthma or sinusitis which later proved to be CSS on biopsy. A previously healthy 10-year-old Arab girl presented with bilateral asymmetrically distributed multiple tender and nonblanching erythematous skin nodules in the lower extremities, ranging between 0.5 and 1 cm in size [Figure 1]. She was well-looking and her vital signs were as follows: temperature 36.5 °C, pulse rate 90/min, blood pressure 90/60 mmHg, respiratory rate 14/min, and O 2 saturation 98% in room air. Physical examination of the head, eye, ear, nose throat, lungs, heart, abdomen, central nervous system, and lymph nodes did not reveal any abnormal findings. Joint examination showed a mildly swollen and tender left ankle, with some restriction of dorsiflexion. The admitting diagnosis was cellulitis possibly secondary to insect bite and she was started on parenteral cloxacillin therapy with analgesics. Her full blood count results were as follows: Hb 13.8 g/dL, white cell count 27.6 Χ 10 9 /L, 31% neutrophils, 10% lymphocytes, 59% eosinophils (absolute eosinophil count 14.9 Χ 10 9 /L), and platelets 343 Χ 10 9 /L. Erythrocyte sedimentation rate was 68 mm/h and serum C reactive protein 24 mg/L (normal < 6 mg/L). There was a further rise of the white cell count to 30.5 Χ 10 9 /L and eosinophils to 67% (20.3 Χ 10 9 /L) within 48 h. Blood and stool cultures were sterile. Stool for ova, parasites and cysts was negative. Complete urine analysis was normal. Figure 1: Multiple nodular erythematous skin lesions of the lower extremities with a tender, oedematous, and erythematous surrounding skin with foot drop of the left leg. A left foot drop with sensory loss over the lateral aspect of the left leg was noted on the third day of admission. Chest X-ray showed multiple fluffy bilateral perihilar infiltrates and computed tomography of the Para nasal sinuses was normal. Rheumatoid factor and antinuclear antibodies were negative. C3 and C4 complement levels were within normal range. Serum immunoglobulin's levels were within normal range except for marginal elevation of IgE levels. Cardiac enzymes levels were within normal limits. Enzyme-linked immunosorbent assay for serum PR3-anti-neutrophil cytoplasmic antibodies (ANCAs) and MPO-ANCA were negative. A bone marrow aspirate done to rule out hypereosinophilic syndrome showed eosinophilic hyperplasia, with no dysplasia or neoplasia. A biopsy of one of the cutaneous lesions showed hyperplastic epidermis with intense dermis infiltration by eosinophils. These cells were also observed in subcutaneous medium-sized vessels, confirming the diagnosis of CSS [Figure 2]. Nerve conduction studies revealed axonal motor neuropathy of the common peroneal nerve and absent sensory potential of the medial plantar and sural nerves. Intravenous methylprednisolone therapy was administered which resulted in a dramatic drop of her peripheral white cell count to 14.6 Χ 10 9 /L and eosinophils to 0.08%. She was discharged on day 7 on daily oral prednisolone (1 mg /kg) and physiotherapy. When she was reviewed 2 weeks later, there was a significant improvement in her skin lesions and sensation with some improvement in her ankle dorsiflexion. Churg-Strauss Syndrome, originally called allergic granulomatosis and angiitis, is a primary systemic vasculitis characterised by an increase in the number of eosinophils in the peripheral blood and tissues, and is almost invariably preceded by asthma or allergic rhinitis. The cause is unknown. Reports of CSS disease occurring in children are very rare, with most having respiratory tract involvement and a history of asthma. , Glucocorticoid-sparing agents used in the treatment of asthma, such as leukotriene receptor antagonists, may unmask CSS when oral glucocorticoids are withdrawn suggesting that the clinical picture of CSS is suppressed by glucocorticoid therapy. , Patients with CSS often also have a marked peripheral eosinophilia exceeding 10%. The most frequent cutaneous findings are macular-papular, nodular, or erythematous lesions on the extensors of the extremities. The characteristic pathologic changes include tissue infiltration with eosinophils, necrotizing or nonnecrotizing granulomas as well as vasculitis involving small- or medium-sized vessels. The American College of Rheumatology (ACR) has proposed six criteria for the diagnosis of CSS in adults. These are: (1) asthma (wheezing, expiratory rhonchi), (2) eosinophilia of more than 10% in peripheral blood, (3) paranasal sinus abnormality, (4) pulmonary infiltrates (may be transient), (5) histological proof of vasculitis with extravascular eosinophils, and (6) mononeuritis multiplex or polyneuropathy. The presence of four or more criteria yields a sensitivity of 85% and a specificity of 99.7%. ANCA positivity is rarely found in children,  unlike in affected adults where they are directed against myeloperoxidase in most of the cases. Our patient fulfilled the criteria for the diagnosis of CSS. She presented with vasculitic skin lesions (with biopsy-proven medium-vessel vasculitis and eosinophilic infiltrates), marked peripheral eosinophilia, peripheral mononeuropathy, pulmonary radiological infiltrates but without respiratory symptoms or a history of asthma. A high index of suspicion is needed to diagnosis CSS in childhood, especially when respiratory clinical manifestations are lacking. 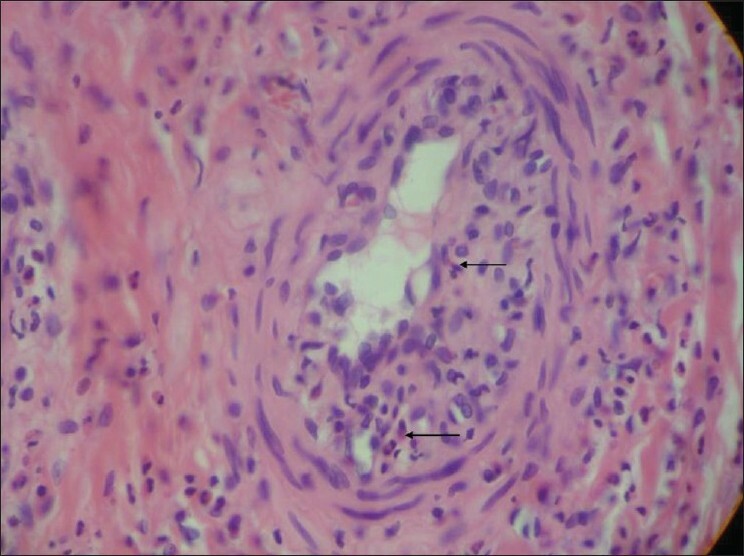 Even when the clinical presentation and laboratory parameters are suggestive, histological confirmation is still indicated to differentiate it from other types of vasculitis especially in cases where eosinophilia is absent such as in patients with bronchial asthma on chronic glucocorticoid therapy. Evaluation for multiorgan involvement is essential, in particular the cardiac, gastrointestinal, renal and central nervous systems, as their involvement has a negative impact on the prognosis. We are grateful to Dr. Nagi A. Moussa, consultant neurologist, Al Ain Hospital, for performing the nerve conduction study. 1. Boyer D, Vargas SO, Slattery D, Rivera-Sanchez YM, Colin AA. Churg-Strauss syndrome in children: A clinical and pathologic review. Pediatrics 2006;118:e914-20. 2. Wilkinson NM, Page J, Uribe AG, Espinosa V, Cabral DA. Establishment of a pilot pediatric registry for chronic vasculitis is both essential and feasible: A Childhood Arthritis and Rheumatology Alliance (CARRA) survey. J Rheumatol 2007;34:224-6. 3. Harrold LR, Andrade SE, Go AS, Buist AS, Eisner M, Vollmer WM, et al. Incidence of Churg-Strauss syndrome in asthma drug users: A population-based perspective. J Rheumatol 2005;32:1076-80. 4. Kobayashi S, Ishizuka S, Tamura N, Takaya M, Kaneda K, Hashimoto H. Churg-Strauss syndrome in a patient receiving pranlucast. Clin Rheumatol 2003;22:491-2. 5. Masi AT, Hunder GG, Lie JT, Michel BA, Bloch DA, Arend WP, et al. The American College of Rheumatology 1990 criteria for the classification of Churg-Strauss syndrome (allergic granulomatosis and angiitis). Arthritis Rheum 1990;33:1094-100. 6. Vemuri P, Greenberger PA, Patterson R. Churg-Strauss syndrome: Survival for 26 years. Ann Allergy Asthma Immunol 2002;88:640-3.